The association between magnets, health and well-being is currently enjoying a revival, but the approach is not new. Magnetic therapy healing possesses an ancient heritage and has occupied a central role in Chinese medicine for over 2000 years. Magnetic therapy is mentioned in some of the earliest writings in Egypt, India and Greece. Until recently the scientific explanation of magnetic therapy healing was not available. Magnetic healing utilizes the natural energy of magnetism that is important to human existence and overall health. A magnetic field provides a natural easy way to assist the body's normal healing processes as the magnetic current passes through all tissues and cells. Studies show that magnets can be an effective therapy for pain relief by blocking pain sensations. Applying magnetic fields to an injured area improves blood circulation and oxygen to enhance the body's natural healing process. The improved blood flow and fluid exchange to the injured tissue helps reduce pain and inflammation. Bio magnetic Therapy is a natural method used to relieve pain, restore energy and enhance sleep. It has proven to be a safe, effective, economical, and a simple to use form of alternative therapy. Magnetic therapy is thousands of years old yet holds great promise for the future. Magnets have been scientifically proven to enable the body to regain its self-healing electromagnetic balance naturally. Magnetic therapy is a non-invasive method with a very high success rate and has much to offer in both prevention and treatment of chronic ailments. Not all magnets are created equally, make sure whatever brand you purchase shows the Gauss strength of the final product, otherwise you'll be missing the beneficial therapeutic aspects. Today in Japan and other Asian countries, therapeutic magnets are licensed as medical devices. Magnetic therapy has found favor in Australia, Russia and many European countries, especially Germany where medical insurance covers some of the costs. Contemporary western medicine uses magnetic energy for diagnosis with magnetic resonance imaging (MRI), and, as a method to accelerate the healing of bone fractures. Magnetic therapy is becoming increasingly popular among progressive health care practitioners, veterinarians, professional athletes as well as the general population. It is a fact our population is aging and the cost of conventional health care is spiraling upward, particularly in the United States. Magnetic therapy, for reasons of simplicity, effectiveness and economy, will become an important form of alternative therapy in the future. According to the World Health Organization the type and Gauss strength of magnets used in magnetic therapy offer no health hazard. Consult your health care professional before using any new type of therapy. Most magnetic products carry warning labels. Arthritic Pain In 1997, Dr. Carlos Valbona of the Baylor College of Medicine, published a study that reported 76% of treated patients using permanent magnets reported a decrease in arthritic joint and muscle pain compared to 19% of placebo patients. DiabeticFoot Pain Dr Michael Weintraub of New York Medical College released a study that showed a significant rate of reduction in foot pain that afflicts millions of diabetics. Using magnetic insoles, nine out of ten (90%) diabetics reported a decrease in painful burning sensations, numbness and tingling compared to 22% reporting improvement in the placebo group. 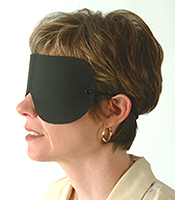 Fibromyalgia Magnetic Mattress Pads Use in Patients with Fibromyalgia, A Randomized Double-blind Pilot Study, conducted by Agatha P. Colbert, M.D., Clinical Assistant Professor of Physical Medicine and Rehabilitation Tufts University School of Medicine, Boston, MA. Conclusions were that "Sleeping on a magnetic mattress pad provides statistically significant and clinically relevant pain relief and sleep improvement in subjects with Fibromyalgia. No adverse reactions were noted during the 16-week trial period." There are hundreds of other clinical trials that prove the efficacy of magnetic therapy some are reported in Gary Null's book Healing with Magnets, and in the excellent work, Magnetic Therapy in Eastern European Research, by Jiri Jerabek, M.D., PHD and William Pawluck, M.D., MSc. Nikken has been the undisputed leader in Magnetic therapy in the USA, offering excellent products and a progressive and lucrative Multi Level Marketing Plan. I own some of these products but have found their prices to be too rich for my blood and out of the reach of many people who might benefit from them. After considerable research we've located one of the oldest and most trusted names in the Bio Magnetic Industry. A manufacturer that has developed and manufactured excellent magnetic therapy equipment since 1981. Even more important to we consumers is that there is no Multi Level Marketing schemes that inflates the end line price to the consumer. With over 100 products, consider us your source for magnetic mattress pads, magnetic jewelry, magnetic bracelets, magnetic necklaces, magnetic belts, wraps, pads and insoles. We're always looking for new innovative magnetic therapy goodies since we use them ourselves. We offer magnetic horse boots, horse blankets wraps for horses and magnetic collars for dogs and cats. You will find a good selection of electromagnetic therapy equipment plus environmental products including electronic air purifiers and magnetic water and fuel equipment. Personally we've used various magnetic therapies since about 1995 and some of the things we've experienced have been incredible. It's not that you feel anything happening, but over the course of time, the general aches and pains that you no longer notice, because they have vanished. You no longer wake up with a stiff neck, back or shoulders, you start to loose the gray in your hair and it begins to revert back to it's natural color. You seem to sleep sounder. We don't like cell phones and only use them for brief periods or for an emergency, however we wouldn't dream of touching it without EMF Proteciton Chip. After a long drive you'll find that using the Magnetic Car Seat instead of emerging nearly crippled from a car, you can get out and actually walk without that stiff feeling. 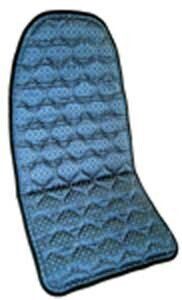 The same for sitting for long periods in the office, you can get up and move without being stiff....we sleep on magnetic mattress pads, use them on our car seats, office seats, wear magnetic insoles in our shoes and always use them for injuries requiring therapeutic help, such as torn tendons & ligaments, sprains, bruises, aches and pains. Personally, there is nothing more soothing than using magnets for pain and magnets for health. For back pain or injuries I find the warmth associated with using the Sota Magnetic Pulser to be ultra relaxing. It takes getting used to what you can expect from using magnets for pain relief. Experiment, ask a friend, read a book or research to get some ideas. Instead of surgery on serious injuries I turn to magnets. After tearing tendons & ligaments in my wrist to the point my hand looked more deformed and into a shape like a claw. It actually had me concerned. I used hot/cold water therapy, the Sota Magnetic Pulser several times daily and would wrap my hand day in the Carpal Tunnel Magnetic Wrist Wrap. After about a week or so the hand and wrist still hurt but was back to a normal shape. I could even wear just the Harmonic Bracelet during the day. Many people prefer dashing off to a medical doctor every time they sneeze, I prefer avoiding them. Bio Magnetic therapy is literally thousands of years old, recognized and appreciated globally. It is rejected and not approved by the FDA. Do some research, ask friends who have used good quality magnets and discover the benefits for yourself. This information is provided for educational purposes only. It does not recommend self-diagnosis and treatment with magnetic products, and of course, is not intended to diagnosis, treat, cure, prevent or mitigate any disease or disorder. Anyone experiencing health problems should consult with a health care professional before starting any new therapy. Do not use magnets or magnetic therapy if using a pacemaker, implanted medical device or insulin pump as they may interfere with the delicate electronic equipment. Magnetic products are not recommended for use during pregnancy. They are not proven beneficial nor detrimental. Be on the safe side, do not use. Keep magnetic products at least six inches away from objects such as credit cards, computers, diskettes, audio and videotapes, and similar items, as loss of data may result. Magnetic Therapy Today~ This book offers complete coverage on new magnetic therapy studies, uses in industry, agriculture and magnetic water and fuel. Also provided is a glossary of keywords in the magnetic health field. A Summary of Health Symptons and corresponding applications of magnetic therapy remedies, and trials. This Magnetic Therapy Health Book is a great read for the Novice Magnetic Therapy follower, or any person wanting to test the magnetic therapy applications for health benefits! It is very easy reading and Mr. Rinker has used simply language to provide and open up the mysteries of magnets for health purposes. La Fuerza Invisible ~ La vida desarrollo bajo la influencia de; campo geomagnetico de la tierra. Estamos rodeados por un mar de magnetismo. El cuerpo humano, sus organos y cada una de las millones de celulas que lo conforman, estan banados por este mar magneticaamente cargado. La regulacion celular, la funcion de los tejidos y la vida misma estan controlados por corrientes electromagneticas internas. En estado de enfermedad estos potenciales electrmagneticos se alteran, pero afortunadamente la aplicacion externa de imanes puede influenciarlos de forma favorable. Bio Medici ~ Effective ~ Natural ~ No side effects ~ Comfortable ~ Practical & Inexpensive! The Bio-Medici has an ultra low, 7Hz frequency selection. This frequency was previously offered on clinical models many times the cost of this unit. Advanced technology provides over 100 frequency selections. The ideal personal therapy device. The battery powered, pocket sized unit is very versatile and user friendly. I've used mine for pain relief, headaches and other minor aggravations and am very happy with it! * No leads or electrodes needed! 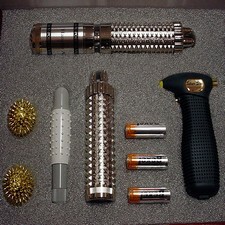 What you see here is a unique therapeutic device from Canada that goes under the name of Bio Medici. It was developed and produced as a result of cooperation between German and American experts and researchers working in the field of biological-medical therapeutics. The Bio-Medici is the only device of this type made in North America by technology developed in Germany by Dr. Ludwig. This device has been sold all around the world since 1988 and it has already achieved major and even spectacular success, some believe, in treating and curing medical conditions. As a result, thousands of enthusiastic users of the Bio Medici treatment method have also dubbed this device the "Miracle Box." Owners of the Bio Medici have even turned into poets and expressed their views in verse, while others have written reports describing the course of their particular medical condition and the success they ultimately had in treating it. It has been technologically perfected and combines in itself everything expected from an effective Magnetic Field Therapy device for self-treatment: It delivers a broad frequency spectrum of positively, harmoniously and biomagnetically stimulating pulses. The device offers universally applicable preventive, curative and combination treatment modalities based on physical principles. Inform yourself about this unique pocket sized Home Magnetic Therapy Device. So practical it can be taken with you anywhere. It provides not only pain relief, but you can support more than 60 different health problems with a long term healing effect. Regenerate and rejuvenate every bone and cell in your body for a new you! There is only ONE authentic Bio Medici therapeutic device anywhere in the world that is manufactured in Canada. Each of these Bio Medici devices has been given a special identification system by the manufacturer in order to guarantee authenticity. Excerpted from a report written by: Prof. O.M. Jansa Ph.D., President of the Association for Biological Research, Complementary and Preventive Treatments, Naturopathy, Preventive Health Care and Health Education. Sota Bio Tuner ~High-Tech Relaxation. The Bio-Tuner is an electronic relaxation system. Micro-current energy pulses appear to have a profound balancing effect on the individual and tends to produce a state of over-all relaxation and well being. The BT-7 by Dr Bob Beck D.Sc. claims that the Bio- Tuner outputs a modified rectilinear waveform with over 500 frequencies in each pulse and is the most well known Cranial Electric Stimulator. Beck claims that it can rapidly balance and restore the natural energies of your body and mind. Some liken this technique to electro acupuncture as it appears to have a similar ability to normalize brain chemistry. Electronic pharmacy balances brain chemistry to normalize and enhance mental, physical, and emotional performance. Promoting rapid, lasting improvements in mood, energy, sleep, IQ, and healing. Some research suggests that these subtle energies may be linked to improved memory, creativity, learning, and intelligence. Using the BT-7 Brain Tuner requires no special effort, training or discipline. The BT-7 is preset to run for a 20 minute session. Most individuals describe the experience as being one of focused deep relaxation, even when high emotional tension has been present. Following the normal 2 to 3 week application routine, many individuals experience significant positive changes in their lives and in their relationships with others. Many users experience a more positive, energetic outlook, better mental clarity and feelings of improved self-esteem. The many daily challenges of life seem easier to handle and negative reaction to environmental stress and tension are diminished. * 3 Year Parts and Labour Warranty on all internally mounted components. The Bio-Tuner has been a leader in electronic relaxation systems since 1983. This product is not intended to cure or treat any disease. These units have not been evaluated by Health Canada or the FDA for safety or effectiveness. Government regulators say that testimonials are misleading and deceptive. Note: none are included. Also, please understand that these products are not intended to nor are they "allowed to cure" or treat any specific disease. Government health departments and medical associations state that you must consult a medical doctor for treatment of all diseases. Individual results may vary. Collodial Silver Generator Pulser ~ Each Colloidal Silver Generator SP5 is a professionally designed quality unit. It is a dual function unit being BOTH a Beck electronic-stimulator and Ionic Colloidal Silver Generator. The Bio-Electric Protocol has changed. SOTA boosted the output voltage from 27 Volts to 31 Volts (from 54 Volts Peak-Peak, to 62 Volts Peak-Peak). A new intensity control was specified to help widen the band of the output control to avoid "bunching" the signal near the high end of the control knob. Constant-Voltage Output - Unique circuitry maintains the required 31 Volts output regardless of battery voltage or other input power (like from an AC-DC Wall Adaptor, Automobile Battery, or Solar Panel). Thus, as the battery runs down or if the input voltage fluctuates, the output will maintain the 31 Volts. No other unit using either 3 x 9 Volt batteries or voltage triplers can offer this very important feature. We use only the purest, Fine Silver Wire Electrodes, 4 Nine Grade (.9999 pure) for the Ionic-Colloid Silver production. Constant-Current Output - SP5 Model has built-in Constant-Current Circuit for Ionic/Colloidal Silver production. * Output monitoring circuit and indicator. * The Bio-Stimulator Probes are of the highest quality. * All electrical wire connections made with Food Grade solders and fluxes for the highest in safety and purity. Alimtox Ionic Foot bath ~ Alimtox Ionic Foot Bath - Eliminating impurities from the body safely and easily. Discover the latest technology that can promote optimum health, increase energy, enhance vitality & induce a sense of heightened well being by eliminating impurities from the body safely and easily. Can you recall the way your body felt the last time you stood next to a waterfall or walked along a beach with the waves breaking at your feet? You breathed deeper into your lungs and abdomen; your brain cleared and the pains in your joints subsided. You felt relaxed and at peace with the world. These invigorating reactions were caused by the ionization of trillions of water molecules. What Is a Cell Cleanse Ion Foot Bath? An Alimtox Ion Cell Cleanse Foot Bath is a top quality high tech detoxification system that provides the right environment that enables the body to heal itself. Equally suitable for professional and home use, the Alimtox Ion Detoxifying Unit is very user friendly and requires no special training. It's the perfect solution for body pollution! The Alimtox Ion Detoxifying Unit is quickly becoming one of the most popular Ion Detoxifying Unit's in today's market due to it's latest technology, ease of use, effectiveness and reliability. This foot bath relaxes, cleanses, balances and enhances the bio energy of the body. Chinese medicine refers to this energy as the "chi". The complex energy fields permeate and realign the body's energy field while improving oxygen levels. The foot bath is widely used to increase both physical and mental energy, vitality, and stamina. At the same time it also purges the body of toxins, chemicals, radiation, pollution, synthetics, and other foreign material clogging up the skin, an essential part of the body's systems of elimination. The internal cleansing promoted by an ionic foot bath also includes parasite cleansing and liver and kidney cleansing. Magnafield Induction Device ~ This Patented device uses a range of 11 selectable frequencies (0.5Hz to 18Hz) of gently oscillating low level magnetic energy. The Magnafield system was proven effective in a double blind, randomized, placebo controlled trial's. The trials were carried out at the Monash University Medical Center in Australia. They showed the beneficial results of using the Magnafield magnetic energy devices as compared to non-operational devices, for both improving the rate of healing of damaged tissue and also relief of pain and swelling. The therapeutic field covers an area of 6 feet from the applicator pad. It operates for 20 minutes ON, 20 minutes OFF, repeating, for the best results. It has Auto Cyclic and continuous Repeat modes. Best when left on all day and night, under the bed or on the floor. Safety tested - TCA/NATA #75087-AS3200.1.0 with amendments. EMC Test C #N3495. Listed on FDA-CDRH (USA) Product Doc. No. B123467; Class MZN; Device Estab. No. 9618015. Comes complete in executive briefcase, with instruction manual, and 12 month Warranty. Lightworks ~ LightWorks offers the benefits of LED light combined with healthy frequencies. These frequencies gently stimulate the body electric for more energy, greater health and well-being. Either Red or Near-Infrared light can be readily applied by placing the Paddle anywhere on the body. A built-in timer automatically cycles through healthy frequencies or individual settings can be chosen. NASA, the Space Agency in the US, has researched the benefits of both Red and Near Infrared (NIR) LED light. In addition to light therapy, the LightWorks offers frequency options to help stimulate the body electric. The LightWorks Hand Paddle has 60 Red LEDs on one side. On the other side, there are 55 Near Infrared (NIR) LED lights plus 5 Red ones for a visible indication that the NIR LEDs are on. NIR light is invisible to the human eye as it lies just beyond the range of visible light. Light Emitting Diode (LED) technology emits single wavelengths of light referred to as monochromatic light that are beneficial for health. Our body cells rely on light to function. We absorb light through our skin and eyes. Light is a stimulus that creates the natural flow of electricity within. Our electrical system, in turn, produces the energy for our bodies to function. Sota Magnetic Pulser ~ The Magnetic Pulser by Sota Instruments is a pulsed magnetic field generator that is professionally designed, thoroughly tested and guaranteed to operate as per the specifications in Dr. Bob Beck's research. The Magnetic Pulser (MPG 5) is designed to generate a powerful (6,000 Gauss) rapidly pulsed (~2.5mS) magnetic field. This operates under a different principle than products using permanent magnets that have a steady, unchanging magnetic field such as magnetic mattress pads and related products. Unlike a number of other frequency generators in our catalog, the MPG is not designed to affect the entire body at one time; instead, the round applicator coil is used to target specific local areas such as muscles, bones, lymph glands and internal organs. Animal owners especially appreciate the magnetic pulser's non-invasive applicator. There is never any sensation or electrical shock when using the magnetic pulser. The applicator head is clearly marked for positive and negative polarities. The side of the applicator displaying the Sota Instruments logo is positive polarity and the opposite side is labeled as negative North Pole. In most cases, the negative North polarity is suggested as it is a constricting or confining energy, whereas the positive polarity tends to stimulate activity and growth. Through the principle of induction, this magnetic field creates tiny electrical micro-currents in living organic materials that contain an electrolyte such as saline. The MPG-5 operating instructions do not give any information regarding specific applications for this instrument as we make no medical claims. Magnetic field therapy is a widely researched subject matter and customers will find a wealth of information in various bookstores or on the internet. Many of our Rottweilers would be happy to demonstrate their belief in the effectiveness of this device. They will back up and position themselves, look at us, look at the Pulser until we get the idea, then they will position themselves where they want to be pulsed. Disclaimer: MPG-5is not a medical device. It is an experimental electronic instrument. It is not intended for the diagnosis, prevention, treatment, cure or mitigation of any disease in humans or animals. It is not designed to affect the structure or function of any system in the body. Magna Still Point Neck Inducer ~ Relaxing relief from stress and pain. A technique used by osteopathic physicians for almost a century to enhance the body's energy and circulation. The gentle pressure at the base of the skull when resting on these 2.5" dia soft foam globes induces a deep relaxation. The Still Point Inducer measures 6.2" x 3.2" x 2.8". 3. Allow the weight of your head to rest on the Still Point Inducer. Not recommended for children under the age of 7. Do not use the Still Point Inducer in case of acute stroke, cerebral hemorrhage, cerebral aneurysm, brain tumors, recent skull fractures, or any other serious condition in which fluid-pressure changes within the skull could be detrimental. If you have any questions, please consult your therapist or physician. Thera Med ~ Superior home care system capable of providing patients with relief from pain in the comfort of their home. After many years of research, Nortek Medical Devices Inc. is proud to announce the development of its first market ready, *PEMF therapeutic device, the TheraMend. This unique medical device is for the repair of bone breaks and damaged connective tissue, for the amelioration of osteoporosis, and for the relief of pain from arthritis, migraine headaches, back pain, strains, sprains and inflammation. *PEMF - Pulsed Electro-Magnetic Fields. The TheraMend is an easy to use, pain-relieving and healing medical device suitable for all active adults in the family. Armed with state-of-the-art software, the TheraMend is capable of delivering 8 pain-relieving and healing/repair treatments. Water Ozonator ~ We can all benefit from more oxygen. Oxygen makes us feel more alert. As a result of environmental pollution, there is less oxygen in our air and water today. Ozone, freshly added to drinking water, provides a safe and gentle increase in oxygen. The Water Ozonator can also be used to sterilize water. As nature's cleanser, ozone purifies our air, soil, and water. Ozone has become a well-known source for sterilizing water systems and bottled water. Laboratory testing using a SOTA unit to sterilize water, proved several virulent pathogens were killed. The Water Ozonator can be a handy item when traveling or camping as it can be operated from a 12-Volt battery. A glass of drinking water can be freshly ozonated in about three minutes. Simply place the airstone in the water and turn the unit on. You will see bubbles forming as the ozone is released into the water. Ozone dissipates quickly into the air, so the water should be consumed within 20 minutes or capped tightly in a thermos or a glass bottle for later use. The Water Ozonator has a built-in timer for 5 minutes, 15 minutes, 30 minutes and 60 minutes. Select the time required based on the quantity of water. 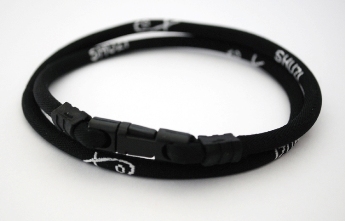 Magna Sports Bracelet ~ The new Magna Sports Band is a very light weight silicone bracelet and is infused with liquid titanium and contains the Shuzi NVT chip. Perfect for athletes, children, or anyone who lives an active lifestyle "The First week I used the Sports Band I noticed the benefits. We had long days at the Shell Houston Open because of bad weather. I finished the event stronger than I started, and I credit Shuzi for keeping my energy and strength high." Harmonic Bracelet ~ This bracelet is crafted into an attractive, high grade woven, bracelet designed to use resonating magnetic fields to maintain balance in the body's aura. The therapeutic rare earth magnets are used in the traditional way to balance the body's electromagnetic meridians that restores the body's natural harmonics. Available in silver titanium. MagnaPrene Magnetic Back Support ~With 16 4000, gauss ceramic magnets. Uses a Velcro closure system. One size fits up to a 42â waist. Can be worn inside or outside the clothing. Popular with golfers, sportsmen, loggers, farmers & construction workers. This style may be changing, so photo may not represent current model. MagnaPrene Deluxe Carpal Wrist Support ~ The MagnaPrene Deluxe Carpal wrist support with thumb hole uses 12 - 4,000 gauss ceramic magnets. We provide a MagnaPatch with an extra magnet which can be attached with velcro anywhere on the band for extra treatment. MagnaPrene Head Band ~The MagnaPrene Head Band uses 4 - 4,000 gauss ceramic magnets. We provide an additional MagnaPatch with an extra magnet which can be attached with velcro anywhere on the band for extra treatment. Magnetic Health & Beauty Mask ~ Made with 19 neodymium magnets north pole magnets are used to firm and tone the skin and reduce wrinkles. 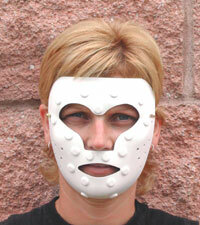 Users note a reduction in sinus problems from using the mask. MagnaPrene Elbow Support ~ The MagnaPrene Elbow Support. Uses 24 - 4,000 gauss ceramic magnets. We provide a MagnaPatch with 2 extra magnets which can be attached with Velcro anywhere on the support for extra treatment. Uses a Velcro closure system. One size fits all. Great for use as a sports support, that nagging tennis elbow or golfer's arm. Golf/Tennis Elbow Magnetic Therapy Wrap ~ Comfort for daily wear or for all sports activities. 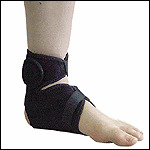 May also be used as an ankle brace. 2" wide x 14" long stretch band includes 6 magnets; each magnet is 0.1" x 0.4" dia and 1,000 North pole gauss. Features easy one hand adjustment D-Bar loop lock ring with Velcro closure and comfortable cotton/wool inner lining. For both men and women, one size fits all. Perfect wrap for golf and tennis. 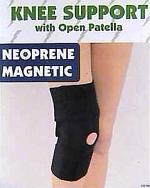 Magnetic Knee Support ~ MagnaPrene Open Patella Magnetic Knee Wrap. 24 North Pole 3950 Gauss ceramic magnets encompass the knee. Fits up to a 20" knee, virtually one size fits all. 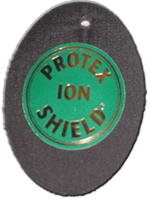 A North pole magnetic patch is included which may be attached for extra relief. Perfect to be worn during sports or walking and running. 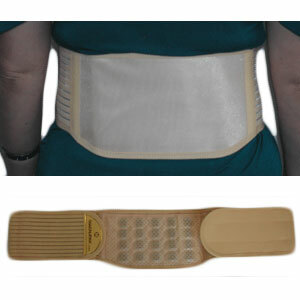 Provides excellent medial and lateral support using a unique velcro closure system. 5 Piece Acupressure Master Massage Kit ~ Accu Master Acupressure Massage Set: This Magnetic, Vibration Massage, and Piezo Stimulation group has every acupressure, relaxing, invigorating, stimulating device designed for chiropractors, massage therapists, shock stimulation therapist, acupressure, and acupuncture therapists and professionals. And the Accu Master Acupressure Massage Set is great for home personal use. 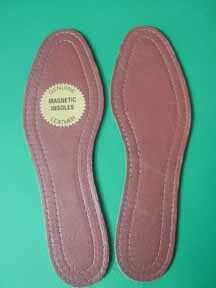 Magnetic Insoles ~ Full coverage magnetic insoles with nylon reinforced backing. MagnaSole has soft foam cushioned Bucktex against the foot. S M L Quality Magnetic Insoles - Full coverage *bipolar magnetic insoles with nylon reinforced backing. MagnaSole has soft, foam cushioned, Bucktex* against the foot. Can be trimmed to reduce sizing. Note. Available in Bi-Polar, all North pole or all South pole orientation. Magnetic SoleMates ~ Walk longer, FARTHER, BETTER. Get the same benefit that people all over the world are experiencing with magnetic insoles. SOLEMATES have several unique features. The dynamic 700 Gauss (manufacturerís rated) inserts are thin, flexible and durable. One size fits all, including HIGH HEELS. Easy to apply with self adhesive backing, simply peel and stick. Standard polarity is bipolar, all North pole available. One size fits all. MagnaPrene Neck Wrap ~Comes with an extra 9 disk MagnaPatch ceramic magnet pad which attaches with Velcro anywhere on the band for additional support. Uses a Velcro closure system. One size fits small, medium and large. If you have that aching computer neck or desk working neck, this may help. 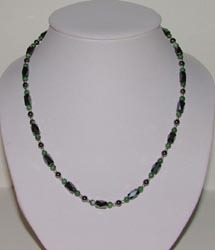 Magnetic Necklace ~ Triple Strength, High Quality Black Onyx Jewelry with semi precious stones. Diamond Cut Beads provide the health benefits of magnets. Beautifully Effective. Available with the following stone colours: Turquoise, Jasper, Rose Quartz, Tourmaline and Jade. This is an attractive necklace that I've worn on nice occasionas, it really helped relieve the tension in my neck. MagnaSports Necklace ~ The new MagnaSports necklace is a very light weight silicone necklace and is infused with liquid titanium and contains the Shuzi NVT chip. Perfect for atheletes, children, or anyone who lives an active lifestyle. Shuzi strengthens and fine-tunes the human biofield, making your mind and body more resistant to the effects of stress in any form, including electromagnetic fields (EMF), harmful emissions radiating from electronic equipment such as cell phones, computers and hair dryers. Electromagnetic fields can stress the body in several ways, such as affecting your heart rate, disrupting your brain activity during sleep and even reducing your body's production of melatonin, thereby diminishing your resistance to cancers. Shuzi uses subtle vibration programmed at the nano-level to create a stronger frequency for your biofield and those cells of which it is comprised, enabling your body to more capably resist the effects of any stress it's subjected to. Your body can reset and self-correct more quickly and easily. Cells communicate with each other by known methods of chemical reactions and through the biofield. They have a resonating frequency at which they operate in order to stay healthy, but these cells are affected by outside electric and magnetic environmental conditions. Subtle vibration can reinforce a cells natural frequency to override outside environmental influences, which cause cells to communicate better. Q Link Classic ~ New Reduced Price with great benefits! Q Link Gold Pebble Polished Finish ~ The Q-Link SRT-3 Gold Pebble Pendant is encased in genuine solid 14 carat gold - it's name and shape conjures images of the breathtaking Pebble Beach Golf Course. Gold Pebble owners will appreciate it's natural beauty and feel. It's the perfect accent for every occasion, from the most informal to the most elegant. It can be worn by both men and women as a signature piece, dressed up or down. Designed by internationally acclaimed designer Neville Brody and powered by our next-generation SRT 3, the result is leading-edge attitude and super-charged power. Magnetic Foot Brace ~ This wonderful natural choice Magnetic Foot Brace gives feet and toes a healthful rest and arch support, especially when walking or standing without shoes. 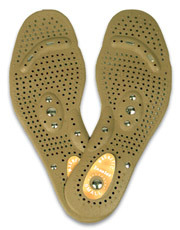 Each 2" x 3" x 0.3" arch pad contains four 800 gauss magnets (8 per pair) and is worn on the plantar or metatarsal arch. The magnets are all North pole. Elastic straps hold the foot pad in place. Pair includes both left and right arch pads. Magnetic Health Pad ~The- Magnetic Health Pad measures 13" x 17" with 18 - 4000 gauss ceramic magnets. This versatile pad can be used anywhere for the shoulder, back, knees, neck. The perfect travel companion, office pal or bed mate. Magnetic veterinary pad ~ 4" x 5" made using a 700 gauss flexible magnet. This is the original equine product introduced in 1986 and available since. It is very versatile and can be used wrapped in a vet wrap or brace bandage to treat knees, hocks, tendons, suspensory, ankles and fetlock. Can be cut with scissors into any size required. Q Link Horse Cuff ~ The Q-Link Equine Cuff is your horses new best "companion" to reach it's most ideal states of well-being and performance. Utilized by some of the worlds foremost trainers to maximize potential and reduce stress, the Q-Link Equine Cuff is ideal for all equines, in every stage of life and career. Robust, lightweight, unobtrusive leather cuff can be fastened to your horses saddle, halter or otherwise. The Q-Link Equine Pendant is water resistant and designed to withstand the rigors of daily use in a variety of environments. HorseTearDrop ~ The Q-Link Equine TearDrop Pendant is your horses new best "companion" to reach it's most ideal states of well-being and performance. Utilized by some of the worlds foremost trainers to maximize potential and reduce stress, the Q-Link Equine Teardrop Pendant is ideal for all equines, in every stage of life and career. Robust, lightweight, can be fastened to your horses saddle, halter or otherwise. The Q-Link Equine Pendant is water resistant and designed to withstand the rigors of daily use in a variety of environments. Magnetic Horse Blanket ~ High strength magnetic horse blanket made from heavy nylon mesh to allow the blanket to be used without raising the animal's normal temperature. Features 4000 Gauss magnets in strips which are aligned with the acupuncture meridians for maximum therapeutic effect. Has been used for foaling mares, colic, athletic injuries, arthritis and senior horses. Magnetic Bell Boots ~ New Improved Magnetic Bell Boots (set of two) with Velcro closures. This boot is now made using 4-4000 gauss magnets sewn into the rubber gum boot. This is a therapeutic boot, not to be used when the horse is training or racing. Standard polarity is bipolar. Also available in all North pole polarity. Phone for special orders.- 800 361 1387. The boot is a standard size but the Velcro closure allows it to fit larger and smaller hooves. Magnetic Equine Knee Boot ~ Therapeutic magnetic knee boot made from neoprene with Velcro closures. Features 16 - 4,000 Gauss North pole ceramic magnets. The monopole North pole magnetic field completely penetrates the knee. Magnetic Dog or Cat Collar ~Specifically designed for dogs and cats. Features a flexible 700 Gauss North pole magnetic strip sewn into the nylon fabric. Finished with a stainless steel buckle and snap ring. Used to calm and pacify nervous, high strung dogs. If your dog is always asking for a neck rub, this might help him. S M L ( *extra small for cats ) Please specify neck size when ordering your collar. Q Link Pet Pendant ~ The SRT inside the Q-Link PetLink contains a fewer number of frequencies than the human Q-Link range. It also utilizes a lower mass of the SRT proprietary materials to coincide with the animals size. The Pet-Link therefore is not optimal for a human being use. Q-Link PetLink can help protect animals from harmful Electro Magnetic Frequencies, hip ailments. along with many other beneficial effects. Ceramic Block Magnet ~ For water treatment and magnetic sleep systems. Ceramic block magnets made from 4000 Gauss ceramic material are used to make revitalized, good tasting magnetic water. Easy to use, simply place a container of water on the magnet for a few hours. Biomagnetic polarity is clearly marked on the durable protective plastic casing. This is an effective magnetic block and may be used anywhere a strong, therapeutic magnet is required. iShield Chips reprogram and transform all biologically harmful and dangerous aspects of radiation and EMF's into a wave form that is biologically compatible with your body, and therefore harmless. iShield Chips also have the unique ability to dramatically strengthen your bodys energetic system, as proven by many testings with the FDA registered BioMeridian MSAS test equipment. This profound energetic strengthening helps your body resist all kinds of stress and is a vital key to your overall health and well-being. Magnetic Pillow Insert~ A versatile high strength magnetic pillow insert, can be used as a magnetic pad for the back, shoulder, neck, arm or any other area. Useful for travel. Size - 14" x 28". Magnet Count 72 - 4000 gauss magnets. 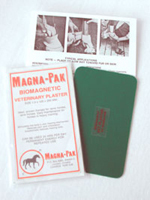 Magnetic Veterinary Pad ~Measures 4" x 5" made with 700 gauss flexible magnet. This is an original equine product introduced in 1986 and available since. It is very versatile and can be used wrapped in a vet wrap or brace bandage to treat knees, hocks, tendons, suspensory, ankles and fetlock. 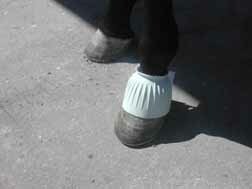 Therapeutic Hoof System ~ utilizes a biomagnetic South pole bell boot with a biomagnetic North pole hoof pad. This layout provides a synergistic effect with the magnetic field flowing from one pole to the other which enhances the healing process making for much faster recovery. 36" car seat pad ~S10BED - Tru-North Magnetic Seat 16" x 36" with Visco tempurpedic memory foam for ultimate comfort. 119 North pole magnets 3950 gauss ceramic magnets. Do you experience back pain when driving? This magnetic pad can be used in a chair/car as a magnetic seat, wheelchair, or lay flat in a bed as a mini mattress pad. Pack in a suitcase for travel. True North Visco Pillow Top Mattress pad ~ King Size 74"x77.5" magnetic mattress pad. 1295 ceramic magnets are placed in an exclusive close grid pattern nestled in hospital grade convoluted finger foam. The top layer is structural grade (.75 ounces per sq. foot) polyester fiber. The 2nd layer is Visco "memory foam" developed by NASA. Visco foam will mold to your body for deep comfort and support which helps relieve pressure points. 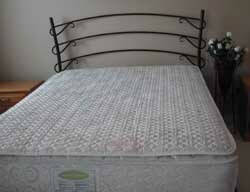 Magnets are placed in an exclusive close grid pattern which prevents South Pole magnetic fields above the mattress pad. Only Tru-North magnetic fields are produced at the surface. Hot melt glue assures the sensitive person no dangerous chemical fumes or solvent. 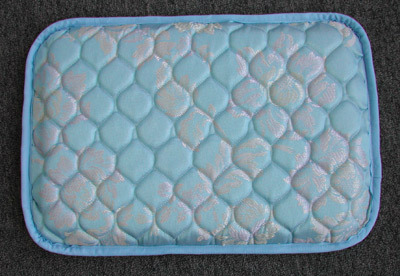 The bottom layer has a polyester fiber padding, quilted to a non-skid surface. High quality, powerful 4000 Gauss ceramic magnets are used for deepest penetration. The Tru-North Visco Pillow Top provides a soft, comfortable sleeping surface. 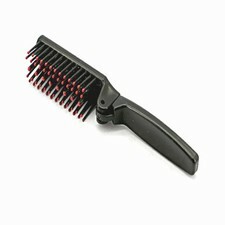 This series is made with magnets in a 2 inch grid pattern, the highest magnet density per square foot in the industry. Features an extra layer of Visco memory foam for luxurious comfort. Provides a pure North Pole magnetic field 16" above the surface of the mattress pad for optimum therapeutic effect. The North Pole magnetic field of a magnet travels in a spiral manner in a counter-clockwise rotation. South pole energy travels in a spiraled clockwise rotation. This can be observed by using a magnet and TV screen (warning - do not bring the magnet too close to a coloured screen as the magnet may temporarily demagnetize the monitor). North pole energy produces an alkalizing oxygenating effect which can help normalize Ph. Other benefits are related to reducing infection and the support of the body's own healing mechanism. Important benefits are the ability of a North Pole magnetic field to produce a deep restorative sleep, to treat insomnia and sleep apnea. Supplementing the earth's magnetic field by sleeping on a North Pole magnetic mattress or by wearing magnetic jewelry and other magnetic devices helps restore the natural magnetic field. Wearing a North Pole magnet over the heart provides the body with magnetic energy through blood circulation. Expert Opinions In his book, The Body Electric: Electromagnetism and the Foundation of Life Dr. Robert Becker observed that an injury site registers South-positive immediately. It changes to North-negative during the healing process, indicating that a North-negative field promotes healing. Dr. W. Philpott explains the pH and the calcium factor in his book, Cancer the Magnetic/oxygen Answer Also, Magnetic Answer for Inflammation, Infection, Toxicity A negative magnetic field combats inflammation and infection and enables the body to resolve troublesome calcium and mineral deposits. A negative magnetic field is effective in relieving pain due to its oxygenation and alkalinizing action. A negative magnetic field enhances deep restorative sleep. The pineal gland produces melatonin in the presence of a negative magnetic field. Oxygen and water are paramagnetic and can carry a magnetic field to all parts of the body through blood circulation. * The earth's North Pole attracts the South pole of a magnet. * The earth's South pole attracts the North pole of a magnet. Have magnets helped you or your animals? Are you a Magnetic Personality....people would love to hear your story. Why not share it?